18 days and counting to go to the big day and with more visitors coming to stay then a hotel, we need more room at the Inn. 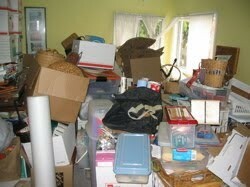 It must be time to tackle the spare room. We call it a spare room but it is anything but. It has many uses, launderette fully equipped with six foot drying horse, home gym complete with treadmill and exercise bike and home study complete with desk, large office chair and books and files strewn everywhere. Creaking open the door I peek inside and also discover bags and boxes full to the brim of clothes and toys meant for our local charity. Looking around the jam packed room it is hard to believe there is a bed in there somewhere that needs to be occupied by our imminent visitors. How am I ever going to sort this one out??? As I stand scratching my head and pondering my options I remember the small unit I took to store my Christmas presents, could they have bigger units? Could they help me find the bed underneath all this? I picked up the phone and called Space Storage and explained to Darren in Space that I simply must have more room in the Inn. “No Problem” were Darren’s words. Amazing I thought. 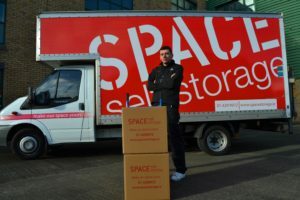 Darren explained that they could drive the Space van to my house and I could load up all my extra belongings into the van and Tomas would drive the van back to Space Storage where I could unload all of my belongings into my unit. Problem solved! Moving day was like a weight was lifted from my shoulders and I finally found the bed in what was now a spare bedroom. It was truly a Christmas miracle!